If you had to guess how old such an important administration would be, what would you say? 200 years? More? Nope. On June 19th of this year, the institution turned just seventy-nine years old. Proving that government has long moved at the speed of a handicapped slug, it took until the early twentieth century for legislators to think, “Hmmmm…. perhaps we need an official location for our treasured, important documents,” and establish the National Archives. A historian named J. Franklin Jameson took up the cause of promoting such a facility in 1908. 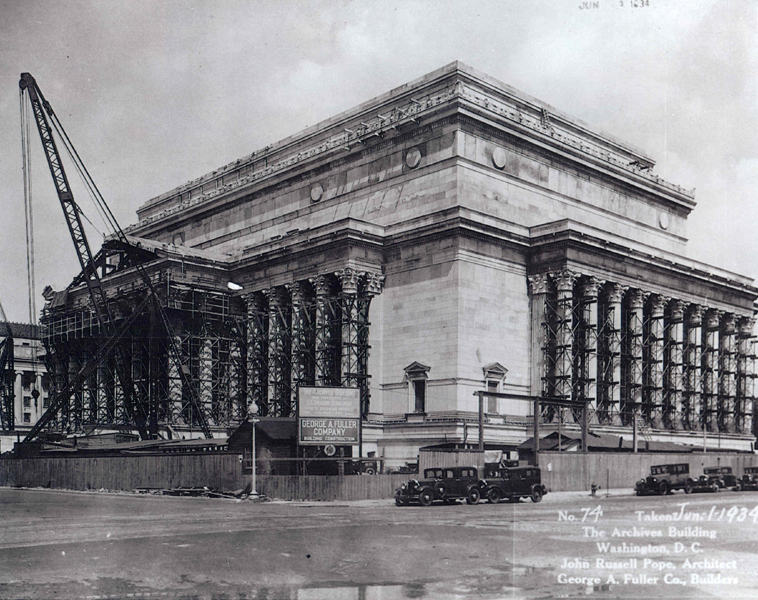 Eighteen years later, in 1926, he finally raised enough money to fund construction of the National Archives. And then it took another eight years for legislation to come to Capitol Hill (by which time the building was already under construction). President Herbert Hoover laid the cornerstone in 1933, just a couple weeks before Franklin Delano Roosevelt took office. And then things stalled again. FDR was perhaps understandably distracted by the enormous problems of the Great Depression. He waited another three months to enact legislation naming an archivist. The job finally went to a professor of history from North Carolina, R.D.W. Connor, at a salary of $10,000 per year. What sort of historically important documents are housed at the National Archives? Just to name a few. You can few the entire list and see image of the documents at the National Archives Home Page here.